For more than a decade, PracticePlanners?? have set the standard for mental health treatment, by presenting complete guidelines and pre-written language for drafting high quality treatment plans and progress notes, as well as by providing hundreds clinically-tested client homework assignments for treating a wide range of presenting problems. Now clinicians can buy a complete set of the most popular PracticePlanners?? in handy, value priced sets. The Child Psychotherapy Treatment set includes the latest editions of The Child Psychotherapy Treatment Planner, the Child Psychotherapy Progress Notes Planner, and the Child Psychotherapy Homework Planner. Each book covers the most common mental health issues facing children, including, blended family problems, children of divorce, and ADHD. Updated to be consistent with the latest Evidence-Based Treatment Interventions, these indispensable resources have been fully-revised to keep pace with the state-of-the-art innovations in clinical practice. 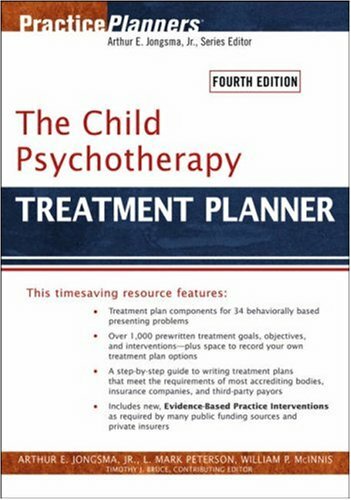 This 4th edition of the Child Psychotherapy Treatment Planner has been revised to include Evidence Based Treatment (EBT) Objectives and Interventions. The latest research evidence has been integrated into the content of most of the chapters. Those Objectives and Interventions that go beyond "Best Practice" to being based on replicable reseach results are highlighted with an EBT symbol. Now the reader can be assured that all the latest research has been reviewed and suggestions for treatment based on successful results are noted in those chapters where research evidence exists. Where there is not sufficient research evidence available for a presenting problem, best practice interventions continue to be suggested. As federal funding sources as well as some other third party payers are beginning to insist on treatment based on research evidence, this Planner offers just such Interventions. Great help with Treatment Plans! This book is a helpful resource for therapists and counselors working with children. Provides practical steps for creating treatment plans.